Finding and keeping up with quality podcasts is not easy. I have some ideas for a better “podcatching” client that would help with this, but in the meantime it’s a manual process to keep pruning my subscriptions to a manageable level. 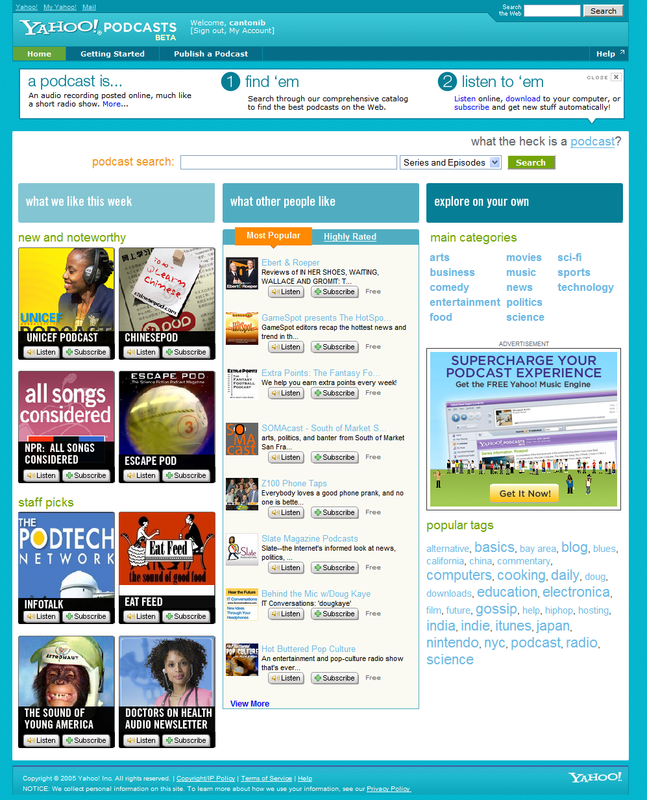 The site seems to focus on finding podcast series and individual episodes, with decent search and tagging capabilities. 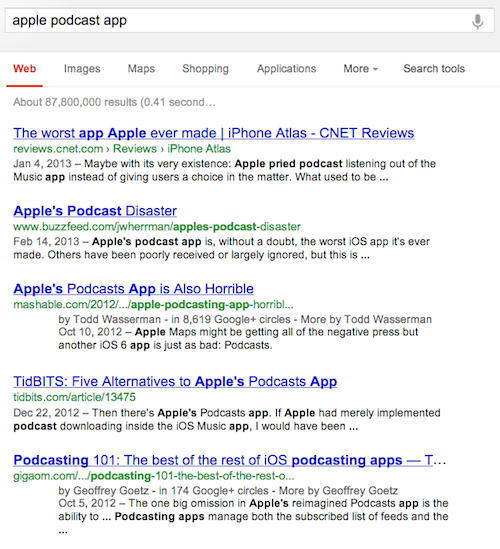 I thought it would keep track of podcast subscriptions for you, but instead it’s basically a searchable directory. You can listen online with a lightweight player, or download a “.pcast” file into YME or iTunes for subscribing and downloading the content directly from the source. It’s new and it’s hip. It’s the perfect time to create a new piece of hardware to support this endeavor. I myself this Palm is in the best position to make it work. Why Palm? Well for one thing you can write code to run on it! That’s absolutely critical. My question is how good is the microphone on the Treo 650? Could someone get enough recording time on the device? Why hasn’t Palm jammed a 5 GB hard drive into one yet? Is it because it would increase the size of the device too much? I think Palm is in the best position to create the ultimate Podcasting device; not Apple, not Microsoft, Palm. I agree completely — the Palm platform has definite potential in this new podcast space. 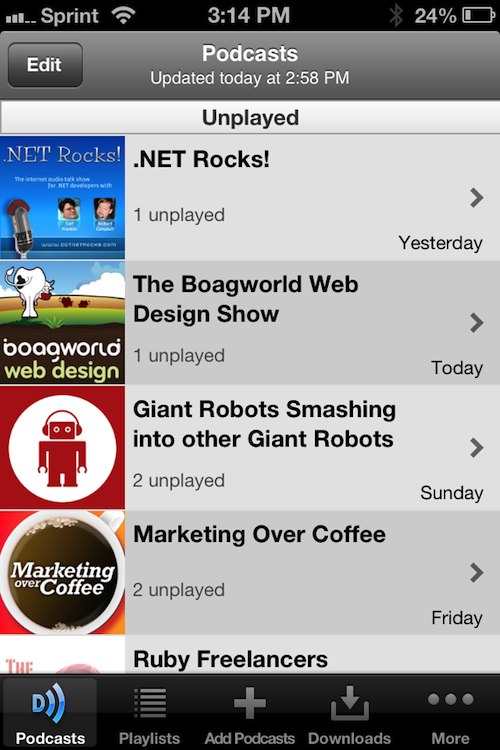 A notable example is Russell Holliman who records his podcasts on his Treo directly; they sound great. Being a programmable system opens up all sorts of application possibilities, such as a dedicated podcasting application that handles recording, posting, and listening duties. On the receiving end, the drop in memory card prices has made PDAs usable for listening to your favorite podcasts. Dedicated MP3 players generally have a file transfer speed advantage (FireWire/USB2.0 vs HotSync speeds), so some improvement is needed there. I’m planning to look closer at this part of the problem to see what can be done with today’s devices. With the rising popularity of podcasting, I’ve been thinking about automated information sources that might be interesting. How about the weather? RSSWeather.com provides RSS weather feeds for different cities. FeedSpeaker is a new .Net application that uses Microsoft’s Speech API to “speak” RSS feeds, recording the results in MP3 format. This is a manual process, but one could easily create a service that did this automatically.